Get Your Tickets For The $25K Game! Tickets are still available for the $25K Game! This game has the best odds around as a total of $25,000 is given away including one Grand Prize of $10,000! The $25,000 game also features a 50/50 raffle, door prizes and much more! Tickets are sold for $100 each and grant you and a guest entrance the night of the event. You do not have to be there to win. Call the Chamber at 978-283-1601 or stop by the Chamber office at 33 Commercial Street in Gloucester this week to purchase your tickets. The office is open Monday-Friday from 9 AM – 5 PM. 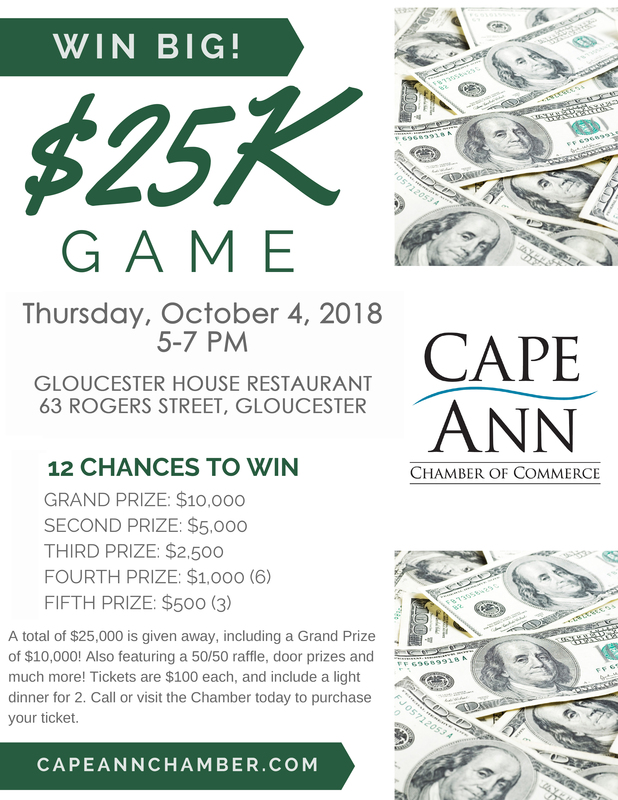 The $25K Game will take place on Thursday, October 4 at The Gloucester House Restaurant from 5-7PM. We look forward to seeing you there! Gloucester Biotechnology Academy: Spaces are filling up – APPLY TODAY!